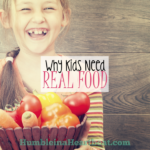 After a long day chasing around kids, running errands, or getting that mountain-high pile of laundry done, is it any wonder that you have less and less energy to cook a meal for dinner? I would probably complain about cooking dinner if it wasn’t something I enjoyed. Fortunately, I do love to cook, but it’s still hard to get dinner on the table with so many other things happening in life (and kids pulling at my legs!). There are but two rules left to discuss from French Kids Eat Everything * by Karen Le Billon, and today’s topic is about taking time for your food. Rule #8 – Take your time, for both cooking and eating. Slow food is happy food. When you cook like a mad woman to get dinner promptly on the table, everyone can feel the stress. Once you all sit down at the table, the tension will be tangible and the fighting will start. The kids will not have any interest in eating because you are breathing down their necks and pushing them to eat. Because of your rushed state, dinner will be a less than happy time for you and your family. But if you take your time in the kitchen each day to cook, to eat, to enjoy, you will start to look forward to this time of the day. In French Kids Eat Everything, Karen says that she started putting on some nice music while she cooked dinner, and her girls started to recognize that their mom was cooking dinner whenever they heard the music. They looked forward to the music and had a more positive attitude about the meal that would be prepared because of it. 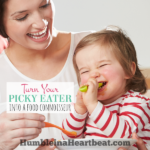 So how can you make your own dinnertime more pleasurable for you and your family? I think before you can focus on eating, you have to focus on the cooking. Make sure you are creating a happy and stress-free zone in the kitchen each and every day. Here are some ideas I’ve come up with. Some of these ideas are from Joshua Becker (author of Clutter Free with Kids) who made some changes to his habits so he could start to enjoy cooking more. When I start cooking in a mess of a kitchen, I just feel completely stressed out. Keep counters, tables, and floors free of clutter before you begin cooking. If you have time before dinner, do the dishes so there can be more space to move around. Starting with foods that require a bit of love and work to get to the dinner table means that you have to spend a lot more time cooking. If you hate cooking this might be one of your biggest complaints. However, if you intentionally decide to learn something new every single time you cook, it might feel like a challenge instead. Perhaps you have no clue how to chop carrots. So watch some youtube videos and then practice. The first few times you might be terrible at it, but as you work more and more with healthy and fresh ingredients, you will improve. For the longest time, we had knives that were not sharp and it would take an eternity to chop ingredients for a single meal. When we finally got just one really sharp knife that was perfect for chopping, we both wanted to cook! Having proper kitchen equipment for cooking is important in enjoying the process of cooking. When you cook, take note what your family likes and try to make those foods more often. It’s really important to have a variety of food, so don’t discount that, but familiarity helps people feel more comfortable . Your family will look forward to eating dinner if you often try to fit in a couple of foods that they all like to eat. Nothing turns off the cooking spark like feeling inadequate. I have made plenty of meals where I didn’t have a recipe and my confidence was shot. I had no idea if the food would turn out, and most of the time it didn’t. Instead of talking down to yourself and saying that you can’t do this, remember all the successes you’ve had. Make a Pandora station called “Dinner music” or something like that. Choose music that keeps the atmosphere in the kitchen relaxing and cool. As you cook each evening, the music will remind everyone in the house that dinner is coming and that they should start to slow down and prepare to eat as a family. I tend to get really impatient with my oldest daughter when she is helping me do things in the kitchen. 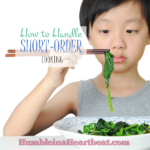 It is hard to let kids help with dinner when we are in a hurry to get dinner done. Once you get to a point when you are cooking slow and enjoying being in the kitchen, let the kids in and help. Try not to yell and recognize that one task may take longer than normal. There might even be messes, but it’s okay as long as the kids are smiling and happy to help. When food looks good, we want to eat it. Kids are notorious for taking one look at the food on their plates and deciding if they want to eat it or not. I think that’s why so many parents like to arrange their child’s food to look cute. Work on plating food and making it look good. You can let your children join in, and this could be a really fun activity to help them want to eat the food as well. Put away all your distractions, including your phone, and sit down around the table with your family each night to enjoy the food that you prepared. 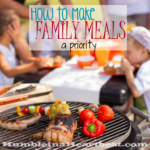 If your family is supportive and on the same page as you with dinner, you will want to continue cooking meals for them. Ask for their support if they aren’t giving it to you. Then when dinner is over, clean up the table and kitchen as a family. Each person should have a task to do. If you have really young kids like mine, they might be able to take their plates to the sink and that’s about it, but try to give everyone something to do. Keep a notebook with all your favorite recipes. One of the most stressful parts of cooking is coming up with something to cook. Make meals that are familiar every so often, and it can lighten your stress and help you relax and enjoy dinner. As you can see, a stress-free dinner often starts with a relaxing cooking routine. Allow yourself time to cook and everyone in the family will start to notice. Your family will begin to look forward to eating dinner, and you just might enjoy this time of the day more than ever. 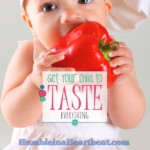 Do you want more ideas for feeding kids? You know how the saying goes, If mom ain’t happy, nobody’s happy! Good luck changing up your dinner routine!